1 - 3.............Don Dayan vom Franckenhorst. 3 - 5,5..........Kira von Romberg. 3 - 5,5..........Vello von Fürstenfeld. 4 - 4.............Bordo von Fürstenfeld. Tagessieger in Papenburg: 100-98-100 = 298 points. DVIN Individual Championship: 3rd place in 1984 and 1985. Landesgruppen Sieger in 1981, 1982, 1983. 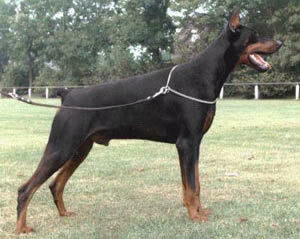 Best Dobermann All Breeds in 1985. Overall Evaluation: powerful constitution; pronounced gender type; dense fur, very good colour, very good markings; normal developed testicles. Head: correct forehead; parallel head planes; bridge of the nose straight; powerful upper jaw, powerful under jaw; full scissor bite; eyes medium-size, oval and dark-brown; correctly styled and cropped ears. Neck: correct length; harmonious and appropriately built. Chest: good depth; very good width; very good rib curvature; good fore-chest. Frontlimbs: good angulation; correct upper arm length; shoulder blades diagonally placed; elbows are good and close; correct pasterns; good stance; short and closed paws; powerful bone. Hindlimbs: very good angulation; very good bemuskelung; thighs are of good length; knees in alignment; correct rear pasterns; medium-strong hocks; short and closed paws; powerful bone. Gait: well-balanced gaiting; good front reach; good rear push, good firmness in back, ligaments and joints. General character in rest position: Calm. Behaviour in the Group: Natural. Effect from sudden noise: calm and sure. Aggression and courage test: middle sharpness, very high protective instinct, fighting spirit and courage and hardness. Recommendation for breeding utilisation: overall harmonious male, no limitation for breeding. Hertog Alpha van Le Dobry achieved the highest possible ratings for courage and hardness at his Körung 'for life' in 1985 (as did his dam Tanja van de Kunnemaborgh in 1983). He twice came third in the DVIN working championships, and in 1985 he shared the podium with Bonni von Nettetal and Björn van Stokebrand. He also won some regional working trails. Hertog Alpha lived to 11 years of age and tested clear for PHTVL/PHPV. Arthos: SchH 3 and passed the Körung with the highest rating plus a winner of numerous German show championships. He is sire of the von Toering “A” litter (Arogon). Asta: SchH 1 and dam of the vom Deister “F, K, O” litters (Karlo, Karin) and von Forell “I” litter (Illex). Graf Guido: SchH 1 and passed the ZTP with 1A rating for character and V for conformation plus winner of numerous show titles. He is sire of the von Frankenland “N” litter (Nelson) and vom Grenzturm “I” litter (Iska). Gringo:SchH 3 and passed the Körung 'for life' with Körklasse 1A rating plus winner of numerous show titles. He is sire of the von der Ruine Hohenberg “G” litter (Grynet). Nathan: SchH 3, DV-DM participant.